Crescent Moon is a bewitching blend of Western and Near Eastern sounds. Dont be misled by the presence of synthesizer wizard Steve Roach, or keyboardist/guitarist Brian Keane, or the guest appearance by the rollicking Bulgarian saxophonist Yuri Yunakovthis is an album with clear and deep roots in the ancient legacy of Turkey and Arabian music. In fact, six of the ten tracks are Faruk's arrangements of traditional folk and classical songs from the Arab, Turkish, and Armenian traditions. Tekbileks newest project also draws on the sounds of Azerbaijani folksong, Persian mysticism, and classical Arabian belly dancing. He even pays tribute, on the song Yalel, to the famed Egyptian singer Omm Kulthum. (Tekbilek himself is half Egyptian.) Working with many of the same musicians who have made such distinctive contributions to Tekbileks earlier albums, he creates a kind of global musica music that acknowledges Greek, Indian, and of course Turkish music, and attempts to find a common ground between all of these. 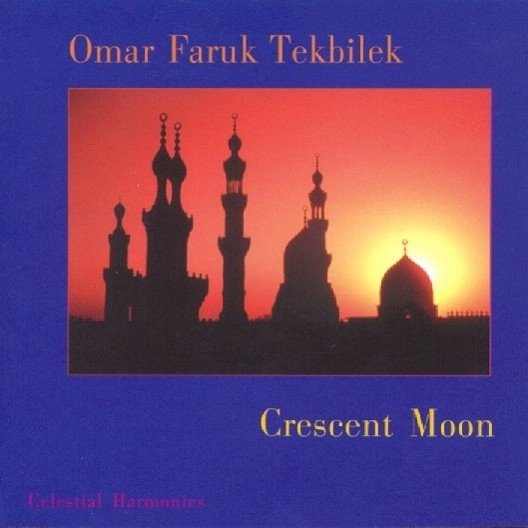 Perhaps his greatest achievement on Crescent Moon is that the album is more than the sum of its parts: it consistently evokes the ecstatic trance of the Sufi dervishes, the biting winds of the desert at night, the rich and exotic scents of an Oriental market, and yet it does so without clearly staying in any one musical tradition. Much of Crescent Moon is deeply personal. Yunnus is a medley of four Sufi tunes, and reflects his longtime practice of this mystical branch of Islam. Adanali is the name both of a folksong and of the town where Tekbilek was born. The album itself is released as Tekbilek marks his 47th birthdayand he reports that both the numbers 4 and 7 have had recurring significance throughout his life. (He has 7 brothers; he was fourth in line; the street address of the house he grew up in was 47; and Crescent Moon is the fourth album he has made with longtime colleagues Arto Tuncboyaciyan, Ara Dinkjian, and Hasan Isikkut.) Ironically, this most personal recording is also easily accessible to Western listeners. By following his own spiritual impulses, and by ignoring geographic and cultural boundaries, Tekbilek has forged a panMiddle Eastern music. Crescent Moon is at once contemplative and exciting, full of lively rhythms and lovely melodiestimeless, and yet very much of our time. By his teenage years, Omar Faruk Tekbilek was one of Turkeys most sought after session musicians. A virtuoso performer on the Near Eastern cane flute (ney) and the Turkish lute, (baglama) Tekbilek was in demand in both jazz and traditional Turkish/Arab music circles. Along the way, he has mastered several kinds of reed instruments, a variety of strings (bowed and plucked), synthesizer, hand drums, and even the accordion. In 1976, he settled in upstate New York. Since then, his music has appeared regularly on concert stages, recordings, and films in the United States, Europe, and Australia. In addition to a thriving solo career, he has played with a wide range of other musicians, from the late Don Cherry to pianist Michael Harrisons Mandala Jones, a band that draws on the poetry of the great 13th century Sufi poet Rumi. 3 Salute to the Sun 8'57"
7 Last Moments of Love 4'56"